Very spacious and luxurious luxury villa with associated detached apartment located in the luxury villa district Vista Royal in Jan Thiel. 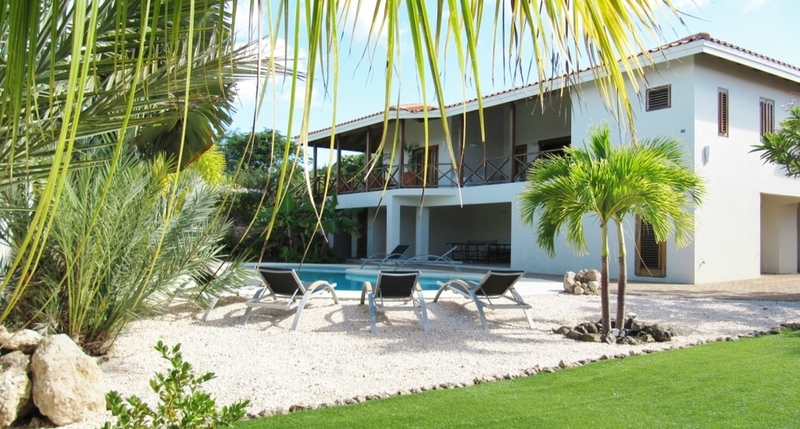 Villa Sans Soucis is situated on a spacious plot of more than 1400 m2 with a large pool of 13 x 7 meters. Around the enormous pool is a beautiful tropical garden with all kinds of palm trees and plants. There is an outdoor shower and outdoor toilet and also beach beds are not lacking. 2 bathrooms and a very spacious laundry room with washing machine and dryer and a guest toilet. The 3 largest bedrooms have shutters with glass windows and air conditioning. The 4th bedroom has 2 small shutter windows without insert glass and air conditioning. The 2nd bathroom is between bedroom 2 and 3, the bathroom is accessible through both bedrooms. If guests from the 4th bedroom want to use this bathroom then they have to go through bedroom 2 or 3 to the bathroom. The spacious covered porch runs almost completely around the house so you can stay at any desired location. The villa is very well located on the wind. The villa is suitable for 8 people. Baby cots can be added for babies. Next to the house is a spacious independent apartment suitable for up to 4 people. The apartment with its own entrance and is equipped with a sitting area, dining area and open kitchen. The apartment also has a spacious terrace. The bedroom with built-in cupboards has French doors to the terrace which overlooks the garden and pool. The apartment has a private entrance and parking space. The apartment has 1 bedroom with air conditioning and 1 bathroom. For the third and fourth person, the sofa can be folded out in the living room into a double bed. There is air conditioning in the living room. It is possible to book the apartment at the extra cost of € 135.00 per day.